People's trust to the Philippine government seems to be long gone during the past administrations. When you mention public officials: they think about politicians who feed on government taxes, when you talk about the policemen: they think about scalawags or criminals in uniform, and when you said government projects: they perceive corruption. 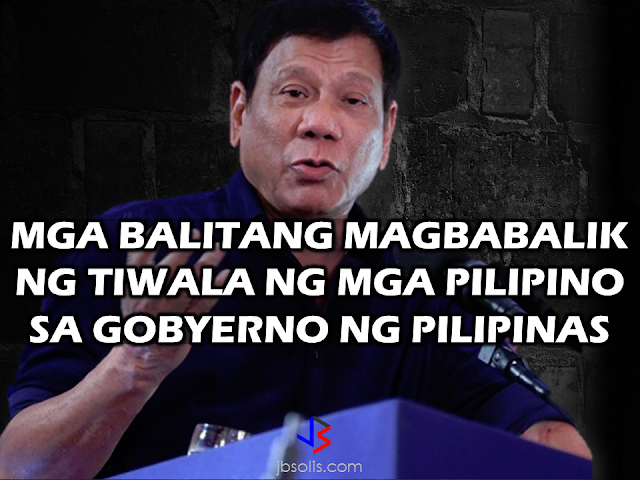 But recent developments regarding the present administration of President Rodrigo Duterte might bring back the trust of the Filipino people to the Philippine government. 1. Approval of the Death Penalty Bill for drug-related crimes. Drug-related crimes has been terrorizing our community for quite long and the culprits seem not afraid of the authorities. With the approval of the death penalty bill that will penalize these kind of crimes, a cloud of fear must me wobbling over their heads now. The Philippines, despite being one of the most expensive internet cost in Asia, ranks #43 in terms of internet speed, limiting the income potentials of Filipinos who are in stocks trading and online businesses. The President is eager to improve internet services and provide free wifi access for the benefit of common people. The firm stand of DENR Secretary Gina Lopez on illegal mining earns support from no less than the President himself. President Duterte has been so vocal on his support to her advocacy of preserving the environment. However, some entities who are against her stand are also doing their best to hinder her appointment. Bribery or "red tape" is rampant in government offices before the Duterte administration took over, now, they try to bribe the government and their actions will backfire and hit them in the face.